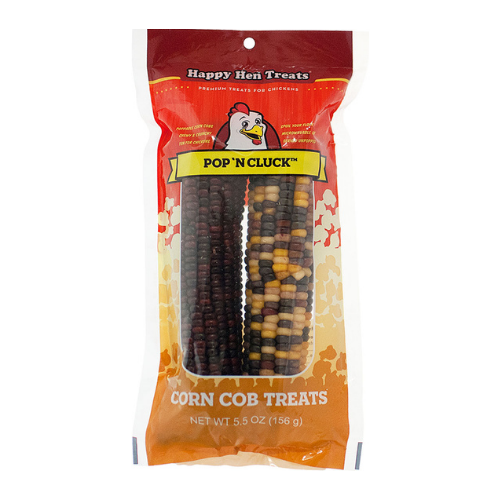 Happy Hen Treats® Pop ‘N Cluck are a new corn kernel treat for chickens. Pop them right on the cob in your microwave or serve as is. However you serve it, your chickens will love this delicious treat! Fun and interactive. Reduces boredom. Hand in the coop or feed on the ground. Serve popped in the microwave or as is. Feed 1 to 3 Pop ‘N Cluck corn cobs per week depending on the size of your chicken. Place a single cob in a microwave-proof dish on high for 15 seconds. If necessary, repeat until corn has popped. Not all kernels may pop. Do not microwave more than 2 minutes. Caution - product will be hot. Cool at least 30 minutes before feeding. Do not leave microwave or children unattended.